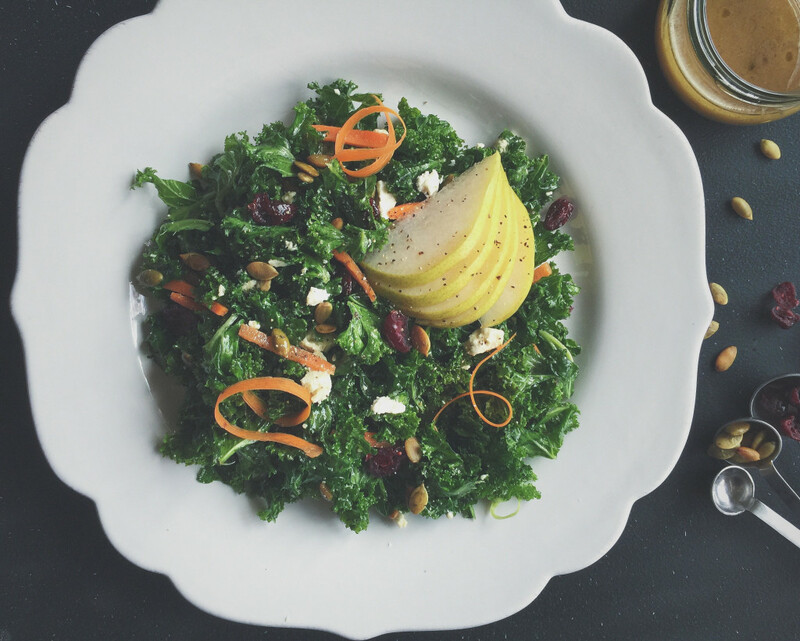 Hearty, nutritious kale gets mixed with a homemade sherry vinaigrette and a marriage of sweet and salty fall flavors in this Harvest Kale Salad. Halloween has come and gone. Which can mean a few things, but if you’re anything like me, means that you most likely gained a few pounds from candy bars (note to self: mini candy bars do not equal less calories when you eat 10) and that you have lots and lots of pumpkin seeds. This salad solves both of these problems! 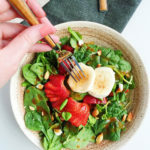 It’s a healthy, easy salad packed with fiber, nutrients and antioxidants that uses leftover pumpkin seeds and also helps balance out some of that Kit Kat and Reese’s bender that you might have went on. Not to mention… it’s just so pretty. The homemade sherry vinaigrette is quite easy and can be made ahead of time. The salad marries kale with cranberries, roasted pepitas, pear, carrots and salty ricotta salata. 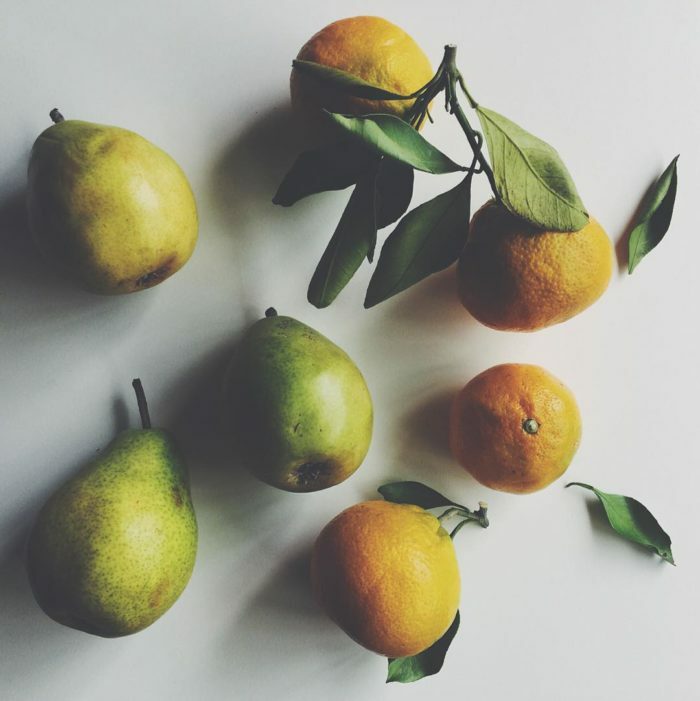 It’s a lovely balance of sweet, salty and tart. 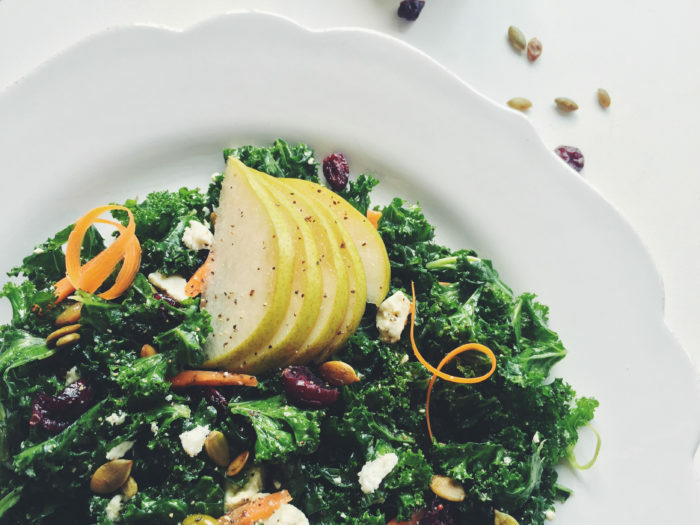 Bonus: since kale is so sturdy, this is a perfect make-ahead salad for work lunches! 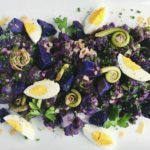 I love the ricotta salata in this salad, but you could absolutely use feta or goat cheese instead. In case you’ve never had ricotta salata, you should definitely try it as soon as possible. I first had the cheese at a Mario Batali restaurant in New York City. Confusion (“the menu said ricotta but this is so firm? !”) turned into delight as I discovered the perfect cheese for salads and garnishes. 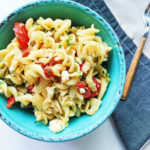 It crumbles beautifully, similar to aged feta, and has a wonderfully salty, fresh taste that doesn’t overpower dishes. It’s also affordable. Score! 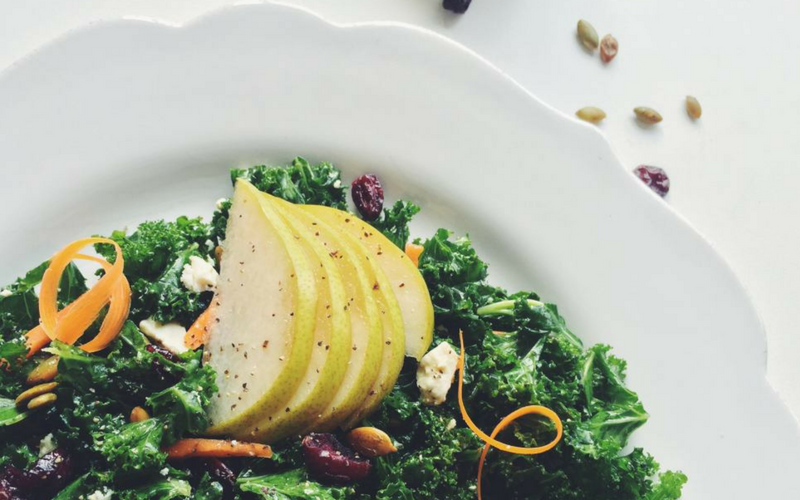 While you may think this harvest kale salad would be too sweet, it’s not. I promise. 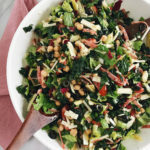 The bitter kale really complements the fresh pear and honey in the dressing; the cranberries and sherry bring a tart punch and the pepitas are a welcome crunch. To prepare the kale, you’ll want to wash and dry the kale and de-stem it, chopping the leaves into small pieces. You’ll then want to give it a nice, therapeutic massage with a teensy bit of olive oil, sea salt and pepper. This will make all the difference in the world. Normally bitter kale will succumb to pressure, soften slightly and tenderize, leaving all its’ worries (bitterness) behind. What’s really happening is that the vegetable’s resilient cellulose structure is breaking down, but all that you need to know is that you’re making a mighty fine salad. This salad is a delightful lunch or would be wonderful paired with some grilled salmon or chicken for dinner. 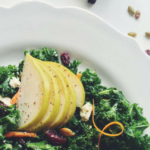 I hope that you enjoy this Harvest Kale Salad! 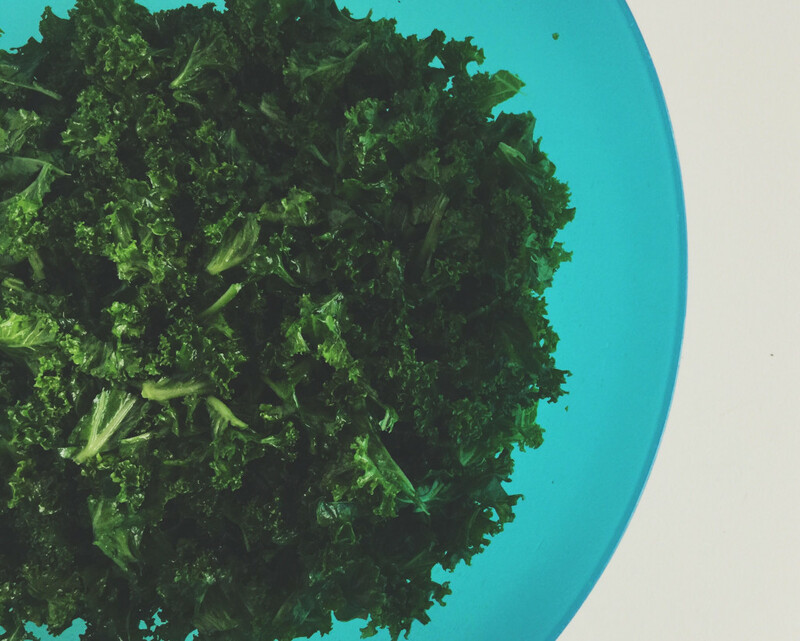 What is your favorite way to eat kale? 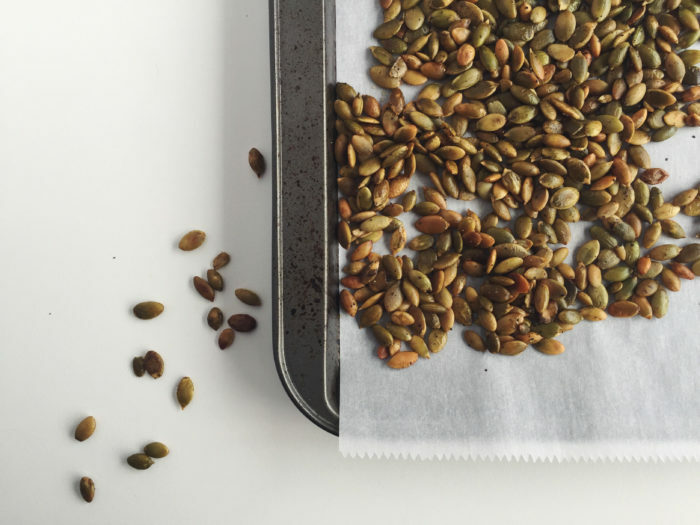 Are you a pepitas fan? Let me know in the comments below! Hearty, nutritious kale gets mixed with a homemade sherry vinaigrette and a marriage of sweet and salty fall flavors. Mix the sherry vinegar, mustard, honey, orange juice and thyme. Slowly drizzle in the olive oil while whisking vigorously until emulsified. Season with sea salt and pepper to taste. 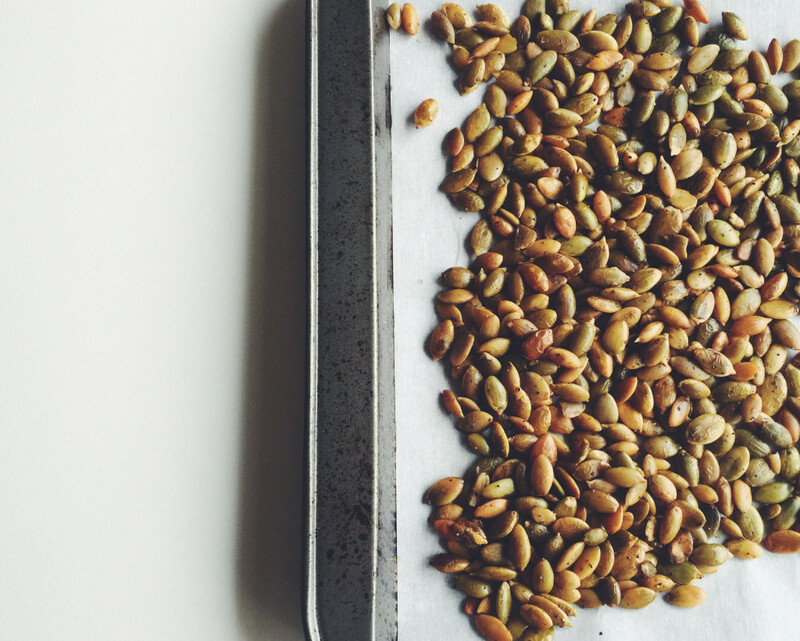 For every 1 1/2 cup of pepitas, season with the sea salt, pepper and paprika and toss in the olive oil. Bake at 350 degrees for about 15 minutes until golden on a foil lined baking sheet. Store in an airtight container. Wash, dry and de-stem kale. Chop the leaves into small pieces and toss in a bowl with a sprinkle of olive oil, sea salt and pepper. Massage the kale for a few minutes, until the leaves noticeably turn darker green in color and tenderize. Taste the kale to see if it’s still bitter. If so, keep massaging! Julienne the carrot. You can shave a few pieces for garnish. 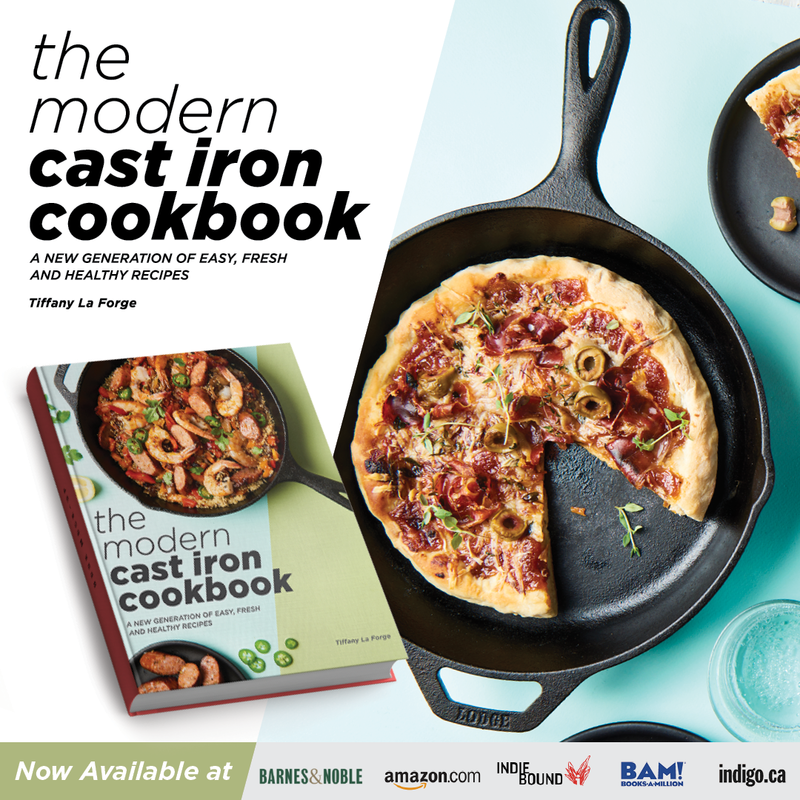 Toss the cranberries, pepitas, carrot and ricotta salata with the kale. Add the dressing, 2 tablespoons at a time until you reach your desired amount. This will depend on how large your kale bunch was, since every bunch will differ. Leftover dressing can be stored in the fridge for a later use. Garnish your salad with sliced pear, pepitas, cranberries, extra ricotta salata if you wish and a generous amount of fresh ground black pepper. Enjoy! This is such a beautiful looking and delicious salad, not to say it is so healthy. I will add it to my lunch menu next week. What a healthy and delicious salad! I’m going to have to add it into my lunch rotation for next week, as I have some pepitas that I need to use up soon. I can’t think of a better way than this! 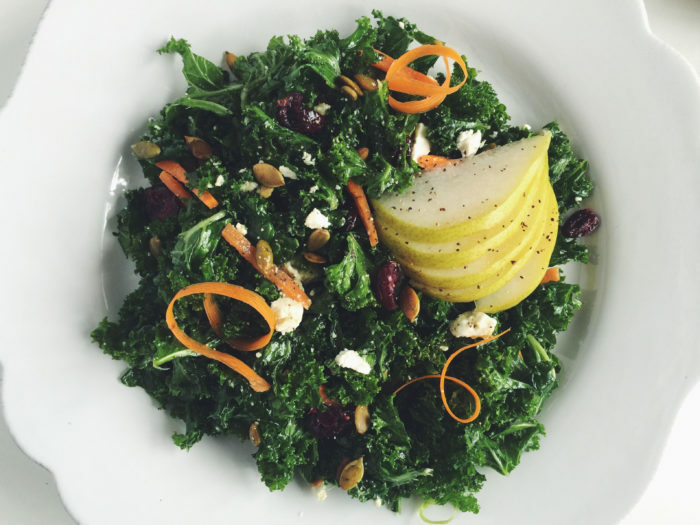 Harvest Kale Salad seems like the healthier option than your regular salads. I would like to make and prepare it tomorrow. So yummy! This salad looks amazing! I love kale! This is a must-try! Oh wow this salad is perfection! I’ve been eating salads recently and my tummy is now trained to just have them. Delicious! This is an absolutely new dish for me. And I quite like the looks & ingredients. Would love to try. 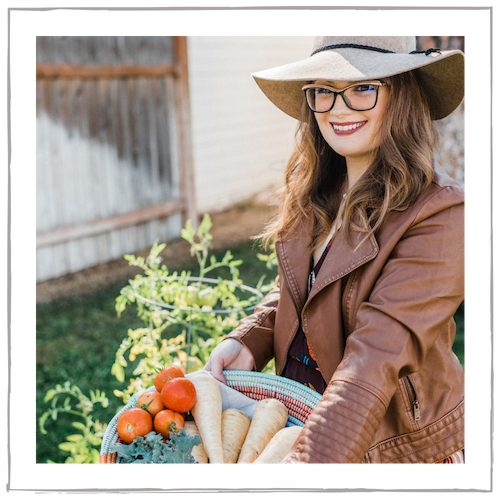 I’m having a garden party in May and I think I found my menu! This salad will be so popular! Bookmarked! This sounds SO delicious. My kids love kale so I might just make this for them. This is an excellent salad. I like vinaigrette dressings, and I don’t think I’ve ever had a sherry based one. I’d love to try this. 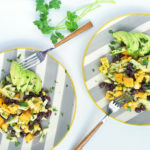 Aw this salad reminds me of the fall – which makes me want to start a count down for the first day of fall because I am so not a summer person, LOL! I need to eat more kale! 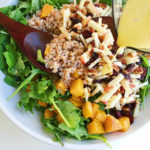 This is a great salad to get back on track! That looks so good! Kale is one of my favorite greens. It has such a great flavor, and it’s also a super food, so it’s just perfect.